Join in on the newest trend taking the world by storm. 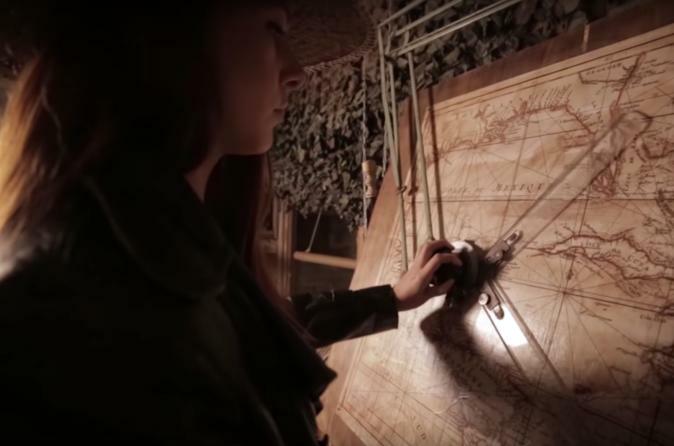 Extreme Escape rooms provide the very best in total immersive entertainment. These games are designed to challenge your mind while promoting team building and communication skills. Use your intuition, brainpower and creative thinking to solve puzzles and uncover secrets and mysteries, all while you race against the clock (60 minutes per game). Our Themed rooms are authentic, carefully crafted and family-friendly. They have been built from the ground up to take our customers into a fantasy world. Your escape room experience begins with a brief orientation. After learning the general rules of the games, you will enter the room and your 60 minutes will begin. You must work together to find the clues and solve puzzles that will lead the team to escape. Each group is monitored by the game masters who are always available to help you if you need any hints or clues to complete your mission. It’s 1945, Las Vegas, Nevada. Bugsy the dangerous criminal got ahold of the secret prints of Las Vegas that would allow him to rule the city. Bugsy got called away for a secret meeting, he will be back in 1 hour. This is the only chance to recover the prints and save the city’s future. Hurry because time is of the essence and you must find his safe, get the documents and leave the place before he gets back. If Bugsy finds you there he will kill you all and take over the city for good. This is your third night in Las Vegas, and you have been having a blast so far. Last night you drank a bit too much and ended up losing Lucy in the crowd. Race against the clock to save her from casino bosses who have captured her. The year is 2028, the virus Code13 was discovered less than half a year ago, more than 75 million people have died from it in the world and the spread of the epidemic virus cannot be stopped for now unfortunately, you guys have also been infected with this new virus, which for now has no cure. You’ve received a tip that a secret lab has developed the antidote to the virus, but it cannot be used until the final test has been completed. You have no time to wait - you need the antidote, otherwise you will all die. In 1950’s central Mexico, a group of bandits have been robbing the ancient Mayan villages. During the looting, they gained the original Mapuche statue, which beholds a plethora of legends. One legend had it that the statue of Mapuche could change the stones into gold. The bandits wanted to use it to revive the sun god. Everything is prepared for the holy ritual, but during the outbreak of the Mexican civil war, they had to flee their place of hiding, which is still untouched underground. Find the statue and prevent the world from going into darkness. Two months ago your rival falsely accused you and your friends of a murder, which sent you to state prison for life. You start to accept the fact that you are going to be there for the rest of your life, when one of your cellmates John Eliott was willing to involve you in his escape plan which he has been preparing for the past 10 months, in exchange for money. He has prepared everything and is ready to put the plan into action. John leads the entire operation from inside the prison, and outside helpers will be waiting for you.